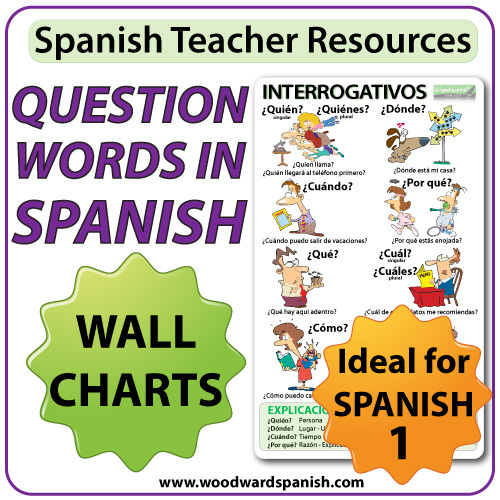 The Spanish question words (Interrogativos) that appear on the main wall chart are: ¿Quién? ¿Quiénes? ¿Dónde? ¿Cuándo? ¿Por qué? ¿Qué? ¿Cuál? 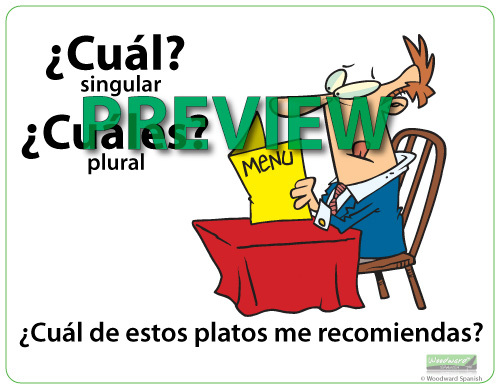 ¿Cuáles? ¿Cómo? ¿Cuánto? ¿Cuántos? ¿Cuánta? ¿Cuántas? 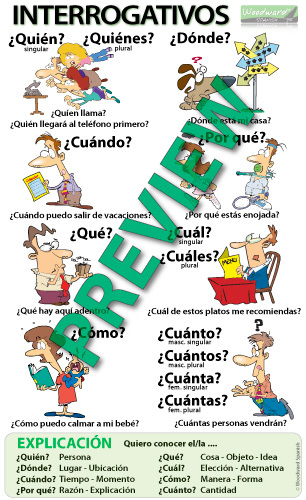 Each question word is demonstrated with a cartoon representing that word and includes an example sentence of it in Spanish. 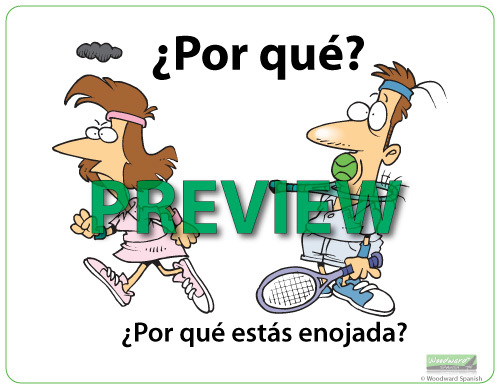 Below the set of cartoons is a simple explanation of when to use these Spanish question words. These wall charts are perfect for decorating the Spanish classroom. You may also want to laminate each cartoon chart and use them as large flashcards. Some teachers also photocopy these and make a booklet for students. Permission to use these charts is only for individual classrooms use. IMPORTANT: All information in the charts are 100% in Spanish making it ideal for Dual language immersion classes. Un afiche mostrando los interrogatios en español: ¿Quién? ¿Quiénes? ¿Dónde? ¿Cuándo? ¿Por qué? ¿Qué? ¿Cuál? ¿Cuáles? ¿Cómo? ¿Cuánto? ¿Cuántos? ¿Cuánta? ¿Cuántas?